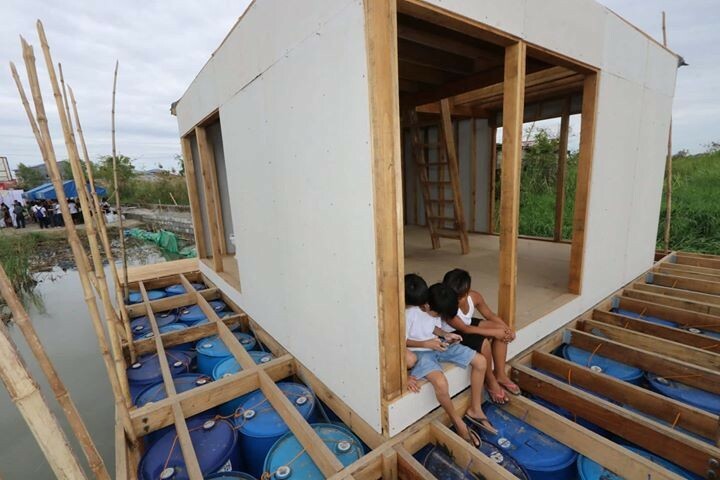 AN INTERNATIONAL non-government organization (NGO) has built a house sitting on a barrel-floating foundation that is expected to address the year-round flooding of communities in the coastal town of Macabebe, Pampanga. Dutch group Finch Floating Homes partnered with the local government to launch its prototype “floating house” in a once vast rice field in Barangay Sto. Rosario. It is said to be the first of its kind in the Philippines. The 7.5 meter by 7.5 meter house with a floor area of 25 square meters and complete with a bathroom and up to two rooms on the attic sits on 140 water drums and coco lumber as its foundation and can accommodate a family of five. Finch Floating Homes spokesperson Peter Ham said, the group built the floating home for around six weeks using materials that are affordable and are available in local construction shops nearby. “Our dream is to make a safe, weather resilient and flood-proof house in areas where it is needed. And to make sure that the house will become a home to Filipinos, we first conducted immersions to understand the situation of the locals. We lived with them, ate with them and slept with them to see their needs and incorporate it in our project,” Ham narrated. As a prototype, the construction of the floating house costs about P500,000, including its foundation and the bamboo used as anchor to ensure its stability and its security from floating away from the coast line, explained Ham. Ham said that the house will initially be a home to a local family to test the feasibility of the structure, its capability and the sanitation process to ensure that it will follow the standards of the Philippine Clean Water Act. “We identified a family of four as initial beneficiary whom we asked to report to us their feedback on the floating house to test the stability of the structure and the possible development we can implement, especially on sanitary solutions, as well as the interest of the people,” he said. The floating house concept is a dream come true for residents of coastal towns who have adapted to living with floods all year-round, Councilor Bembong Balgan said. She disclosed that since the eruption of Mt. Pinatubo in 1991, the flooding problem in Macabebe has worsened and left hectares of once rich rice lands into a water world that have since become idle. “We have to make these lands useful again because these are properties, these used to be source of livelihood but have become idle for more than ten years now. This is a perfect example of how the floods have worsened in Macabebe over the years,” she said. “Our dream is to build a floating community, the homes and the schools to prevent the interruption of classes due to flooding. This is the situation, flooding in all the 25 barangays. Some of them experience it year-round, so we have to move even if it means adapting to the situation,” she furthered. For the program to be sustainable, Balgan said that it cannot be always be charity from NGOs or the government but needs the participation of the people. “Remember that below the water where it floats are lands that are owned by private individuals. This is a massive project that gives opportunity for us to live beyond the problems we do not have control with,” Balgan said. She, however, noted that the local and national government may seek programs that can provide assistance to individuals or families interested in the program.